The Fiji Airways Flying Fijians lost 54-17 by Scotland in its autumn test match at BT Murrayfield Stadium in Edinburgh this morning. Tries from Viliame Mata and Semi Radradra had Fiji in front briefly but they had no answer to the hosts’ composure, fitness and control. Fiji were trailed 21-17 at the breather. 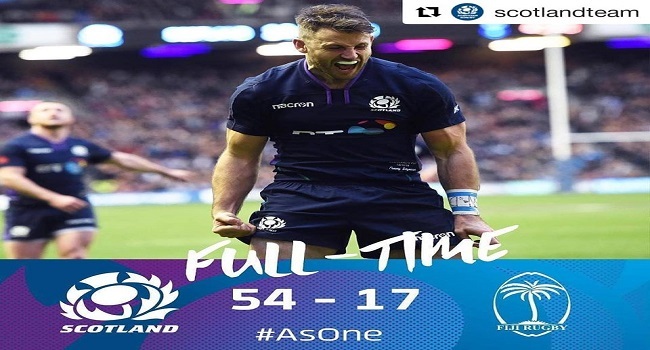 Scotland scored three tries in the first half and added another five unanswered tries in the second spell to seal the victory. Tevita Cavubati and offload King Leone Nakarawa were yellow carded in the match for dangerous tackle. The Fijian side will now play Uruguay next Sunday and will then battle France on the 25th of this month.